Today we're releasing a new update to Power BI that brings lots of new capabilities to enable users to create reports. 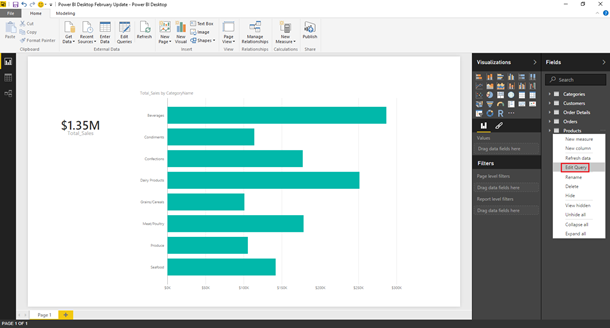 This update includes new authoring capabilities as part of a new Power BI Desktop release, as well as support for these new features in the Power BI service for report consumption. You can watch the following video or continue reading the rest of this blog post for more details about each feature. 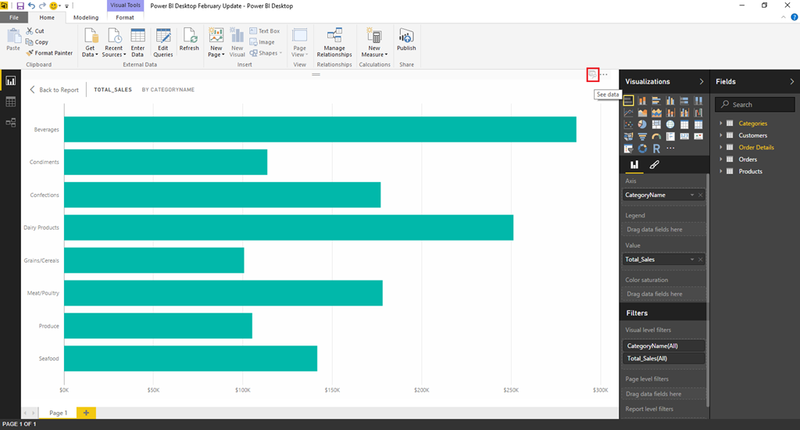 Users can now see the data that backs any given visualization in their Power BI Desktop reports. In order to get to this view, users need to first get into “Focus Mode” for a visual by clicking in the top-right icon next to the “…”. Once in Focus Mode, they can click the “See Data” icon on the top-right corner of the visual. 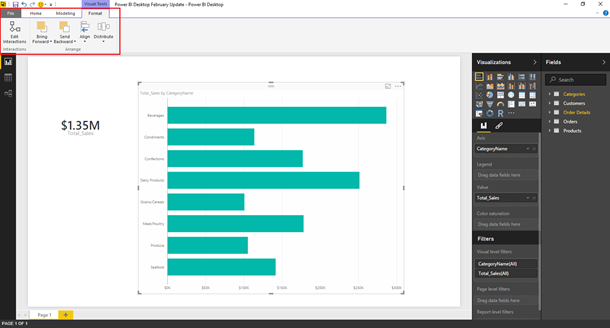 This creates a split view where both the visual and the data behind it are displayed to the user at the same time. In this view, users can also control the layout by using the “Switch Layout” button in the top-right corner of the view. 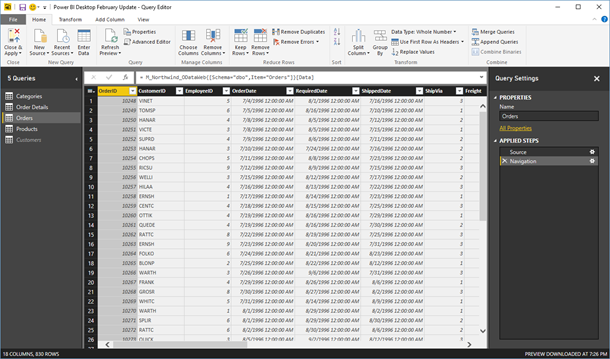 Finally, users can also export this table of data into a CSV file by accessing the “…” menu options and clicking “Export Data”. We have made improvements to the existing Map visual, so that users will now be able to plot data points based on latitude and longitude values only, as opposed to the previous behavior which also required a Location text field to be provided. 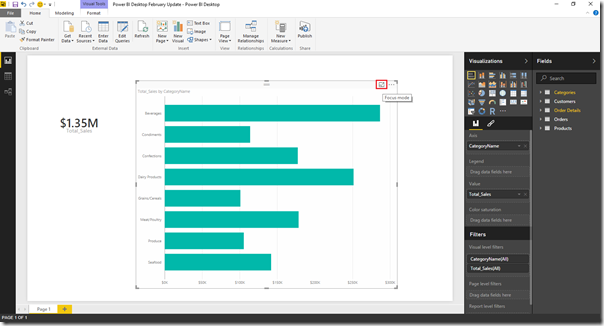 KPI Consumption has been a Preview feature in Power BI Desktop for the past few months. This month, we’re taking this feature out of Preview and making it a fully supported GA feature. 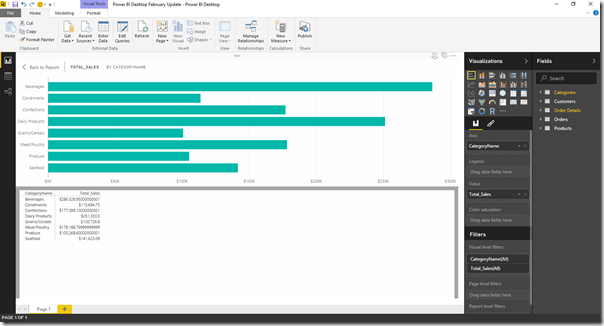 KPI trends for SSAS Multidimensional models’ KPIs. In this update, we’re also adding support for Display Folders when using Analysis Services Exploration mode. 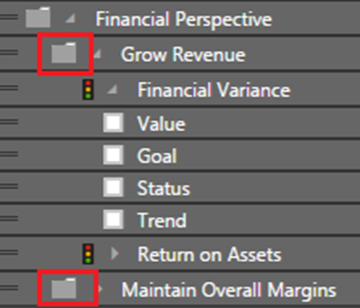 Display Folders will show up in the Fields pane when in this mode and provide a more logical grouping of fields and easier navigation experience within the Analysis Services model. We’ve added a new contextual ribbon tab to include all Report Tools that are contextual to the selection of one or multiple visuals in the canvas. We’ve added a new visualization type in this update. This new visual aims to provide a way to visualize a KPI value over time, as well as an indicator for how it compares to the target value. 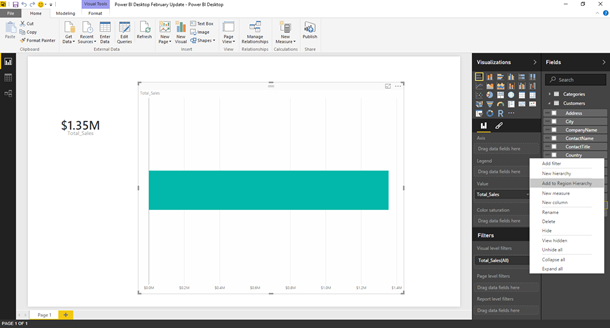 Starting with this update, Power BI Desktop will remember the last page that was in view within a report and will bring that page into focus when the report is opened again. We have added a shortcut for editing the query behind a table in the Field List, for both the Report & Data views. 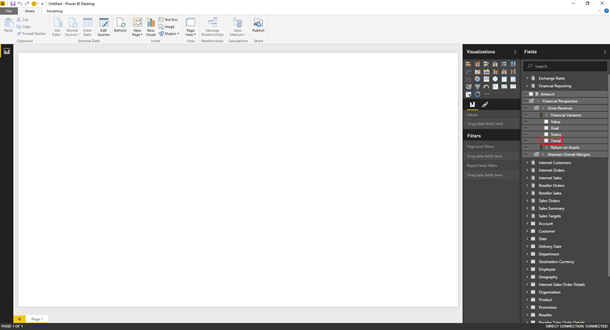 Using this shortcut will bring up the Query Editor window and automatically select the specific query to modify. This option is available in the table context menu. We have added a new ribbon button to allow users to duplicate the current page in their report. Before, this option was only available as a right-click menu option in the page tab at the bottom of the report view. The new entry point makes this option much more discoverable and easier to access for users. 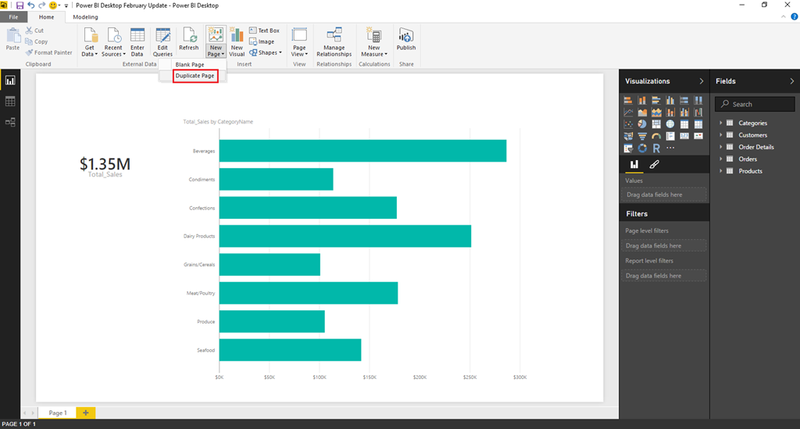 With this release, we’re introducing the ability for users to define their own hierarchies within Power BI Desktop. Users can right-click on any field in the Fields pane and select the “New Hierarchy” option. After creating a new hierarchy, users can add other Fields from the current table into the hierarchy, in the desired order. Users can then drag the hierarchy to a visual that supports Drill capabilities (such as a Cartesian visual), in order to be able to leverage the hierarchy for Drill Down/Up gestures within the visual. We have made a performance improvement to optimize the process for renaming Tables & Columns from the Report and Data views. Users will notice a much lower latency of these two operations. This month we’re enabling DirectQuery support for Oracle and Teradata databases. This feature is currently available as a Preview. Users can enable this feature from the Options dialog: File -> Options and Settings -> Options -> Global -> Preview Features. 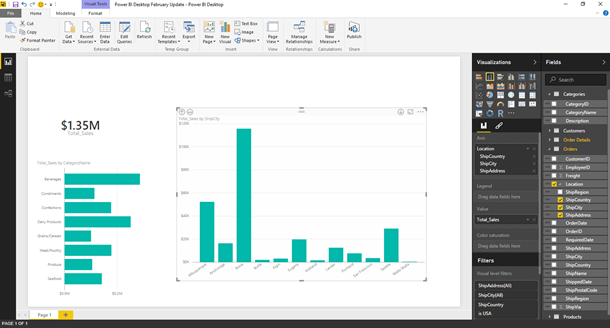 DirectQuery mode allows users to create reports that interact directly with the underlying data sources without the need of importing the data locally. With the addition of this mode for Oracle and Teradata, we provide lots of flexibility to users who depend on these two sources as they can now decide whether to work on DirectQuery or Import mode within their report. Last month we added the ability to create Measures in DirectQuery mode. This month, we’re enhancing DirectQuery mode by enabling the ability to also create Calculated Columns. 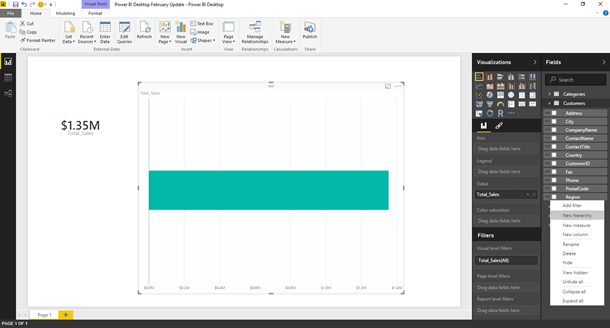 It is now possible to specify what Enterprise Gateway to use when publishing a report from Power BI Desktop that uses an Analysis Services Live connection. Before this update, users were only able to succeed in publishing their report if they have only one gateway configured. With this update, users can now pick which gateway to use if they have more than one configured for them. Users can import data into Power BI Desktop by using REST APIs that produce data in JSON format. 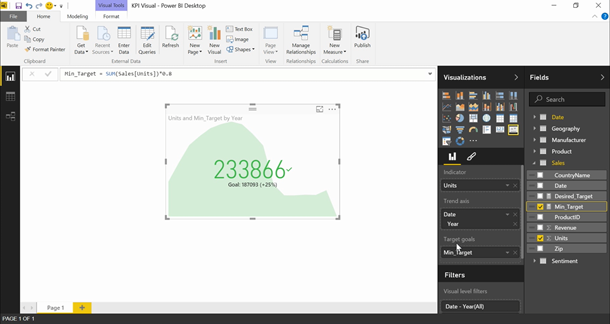 This capability has been available in Power BI Desktop for a long time, however it was not very discoverable. Users could use the “From Web” connector and provide a URL to a JSON endpoint, or use any of the “From File” options and point to a file containing JSON data. With this release, we’re adding a new entry point to the “Get Data” dialog, under the File category, to allow users to import “From JSON”. Users can then provide a path to a file containing JSON data. We’ve added a new connector this month to allow users to import data from their SQL Sentry accounts. This new connector allows users to analyze and share performance and operational data collected by SQL Sentry, such as Server Health, Server Availability, Disk/Memory/CPU Utilization, etc. We have improved the CSV file connector to automatically detect jagged CSVs. Jagged CSV files are characterized by having different number of columns across rows, generally with more columns showing up after the first few rows with less columns. With this update, the detection logic for data columns in CSV files has been dramatically improved to recognize these extra columns. There’s no additional user action required to benefit from this improvement (besides importing their CSV file again using the latest product version). In this update, we have added support for authenticating using a Microsoft Account (Organizational Account) when using the Exchange connector. We’re improving the SharePoint List connector by performing validation of the URL provided by the user to connect to their SharePoint List. 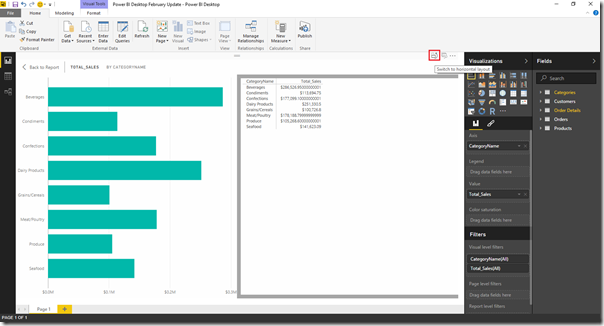 Users can provide the URL to their SharePoint Site root and Power BI Desktop will detect all SharePoint lists available within the site and present the user with a Navigator dialog displaying all available lists. With this update, when users provide an invalid URL they will be notified about this issue and won’t be able to move forward. Before this update, users would get a subsequent error due to using an invalid URL, which was not indicative of the actual issue. 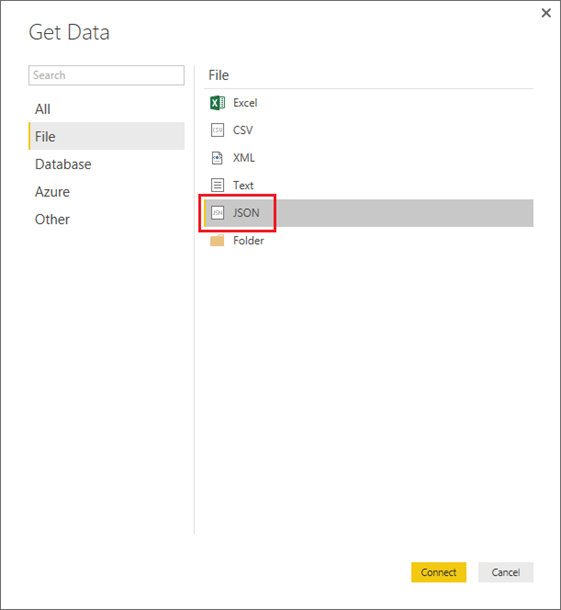 Users can also provide the specific URL to their SharePoint List by using the OData Feed connector. Users can now disable Navigation Columns when connecting to databases. 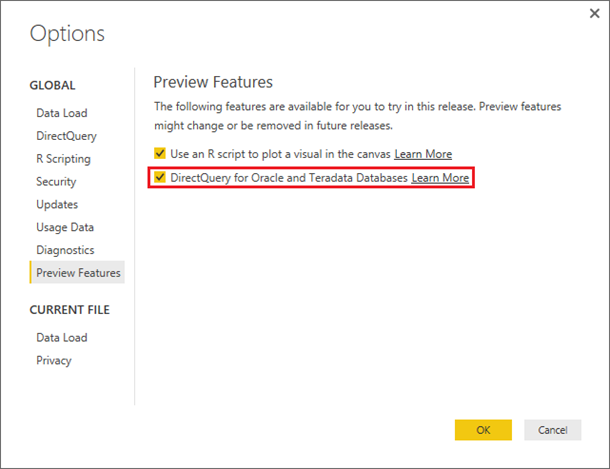 This option allows a big performance optimization in retrieving data previews from databases, when Navigation Columns are disabled. 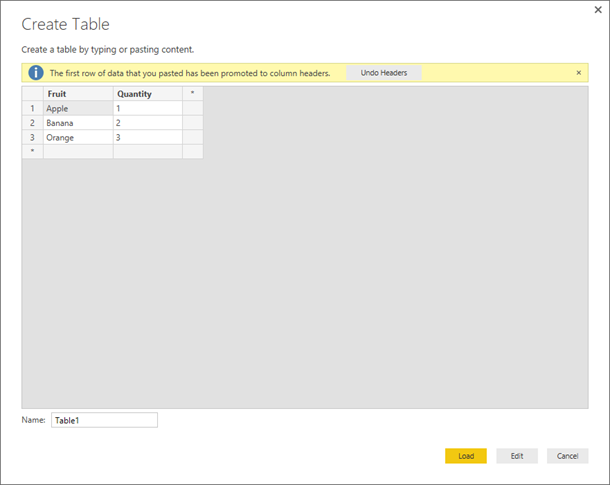 Navigation Columns are extremely useful when trying to expand or aggregate fields from a related table in a database. For instance, from a Customers table that has relationships to an Orders table, users could expand fields from the Orders table to get the list of all Orders from all customers. Similarly, they could also perform aggregate operations over fields from the Orders table (such as the Sum of Total Order Prize). 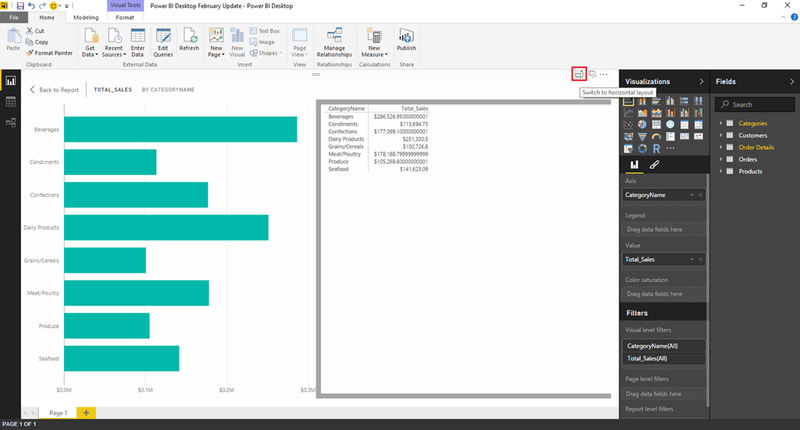 This would allow them to easily combine data from multiple related tables by just leveraging the existing relationships in the database and the Power BI Desktop UI options (Expand and Aggregate). However, when not interested in this type of data transformations, it turns out that the cost of retrieving Navigation Columns for a given table is high enough that it degrades the performance of retrieving data previews, thus, degrading the overall user experience for simple scenarios. 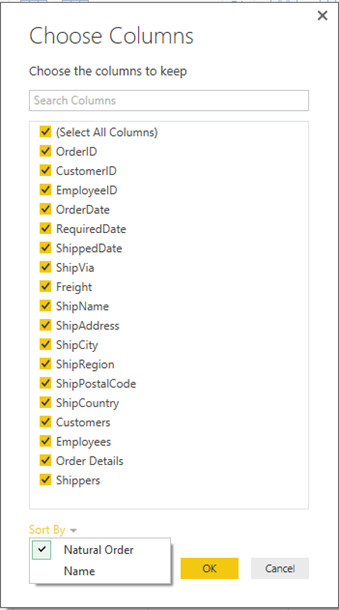 With this update, we’re introducing a new option in the Source dialog for database connectors to disable importing these relationships or navigational columns. 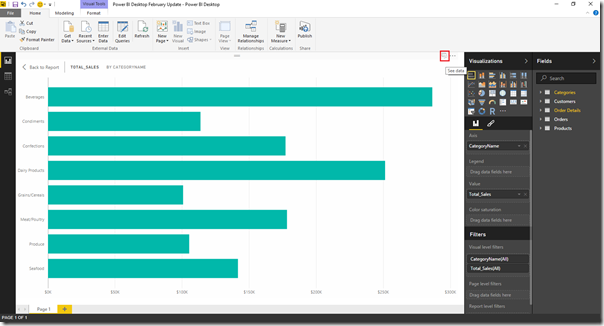 Please note that this option is available for all relational database connectors except for SQL Server, Azure SQL Database, SQL Server Analysis Services and SAP HANA. We’re improving the Credentials prompt when connecting to Web data sources to allow users to specify the scope to which they would like the credentials to apply. Users can now pick any of the levels within the URL (domain, specific page and all levels in between). “Enter Data” is a new feature introduced in the December update. This feature allows users to create data tables by typing them manually or pasting them from the clipboard. In this release, we’re making enhancements to the “Enter Data” dialog to automatically detect column headers when users paste in data. Support for Field Labels in the Navigator dialog. The “Choose Columns” transformation builder has been improved to allow users to sort the list of available columns either alphabetically or based on natural order (previous behavior). The default sort continues to be Natural Order, that is, the order in which the columns appear in the table. We have improved the performance of common transformation operations within the Query Editor (Rename Columns, Remove Columns and Reorder Columns) to provide a better user experience. These operations are now performed locally, rather than requiring a reload of the data from the remote data source when applied. 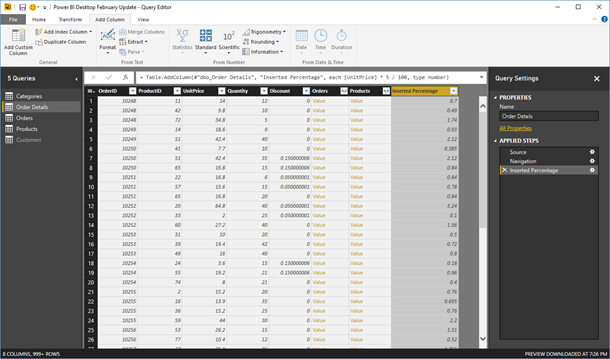 We have improved the Query Editor data preview so that it can display as many columns and rows as they exist in the table. Before this update, there were a set of restrictions such as a maximum number of cells displayed in the preview (3,000) and a maximum number of columns (100 columns). With this update, we have removed these limitations and users will be able to scroll in the table preview to see the entire set of contents. 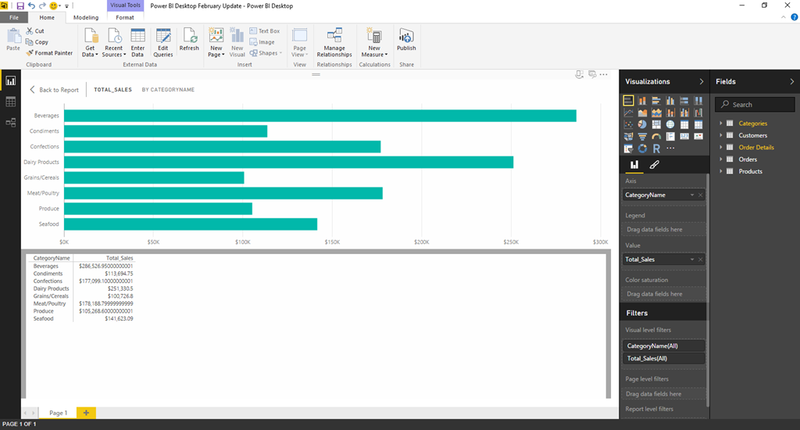 With Power BI Desktop, users can decide which queries to load for use within the Report and Data views, and which queries not to load because they’re just intermediate queries that do not need to be used in the Report/Data views. These options are available as context menu options on each query within the Queries pane in the Query Editor window. However, before this update it was not easy to see which tables had been disabled from loading and which ones are being loaded, since this required right-click on each query to check the state of this option. With this update, we’re introducing a different visual representation of unloaded queries in the Queries pane in the Query Editor. Unloaded tables are displayed in italics font and with a slightly different font color, such as the “Customers” table in the following screenshot. Users can now easily calculate a percentage amount based on the value in a different column. In order to do this, users had to type Custom Column expressions in previous releases. With this update, users can simply select the original column and then click “Add Column -> Standard -> Percentage” in the Query Editor ribbon. They will be asked for the Percentage value to apply to the original column and they will get a new column as the output containing the result of this calculation.